The heart has evolved in mammals to deliver its unique and crucial function of ejecting and collecting blood to and from the circulatory system, respectively. The heart is divided into four chambers. The upper chambers are termed atria, and the interatrial septum constitutes the division between them. The lower chambers are termed ventricles, and are divided by the interventricular septum. Left atrium. The upper right chamber of the heart. The left atrium receives oxygenated blood from the lungs and pumps it down into the left ventricle which delivers it to the body. Right atrium. The right upper chamber of the heart. The right atrium receives deoxygenated blood from the body through the vena cava and pumps it into the right ventricle which then sends it to the lungs to be oxygenated. Left ventricle. The left lower chamber of the heart that receives blood from the left atrium and pumps it out under high pressure through the aorta to the body. Right ventricle. The lower right chamber of the heart that receives deoxygenated blood from the right atrium and pumps it under low pressure into the lungs via the pulmonary artery. The heart valves allow blood to flow in only one direction through the heart, opening and closing in response to differential blood pressure on each side. There are two types of valves in the heart. The semilunal valves prevent back flow of blood from the arteries to the ventricles. The atrioventricular valves regulate the blood flow between the atria and the ventricles. Aortic valve. One of the semilunal valves, this valve is situated at exit of the left ventricle of the heart where the aorta begins. The aortic valve lets blood from the left ventricle be ejected into the aorta but prevents blood once it is in the aorta from returning to the heart. Pulmonary valve. One of the semilunal valves. ituated between the right ventricle and the pulmonary artery and performs similarly as a one-way valve. The pulmonary valve lets blood from the right ventricle be ejected into the pulmonary artery but prevents blood once it is in the pulmonary artery from returning to the heart. Mitral valve. Also known as bicuspid valve, is one of the atrioventricular valves, is a dual-flap valve in the heart that lies between the left atrium and the left ventricle. The mitral valve opens to allow passage of blood from the left atrium, and closes when the left ventricle is full of blood, to prevent backflow. Tricuspid valve. One of the atrioventricular valves. Located between the right atrium and right ventricle and ensures the flow of blood from the right atrium into the right ventricle and prevents the reverse. 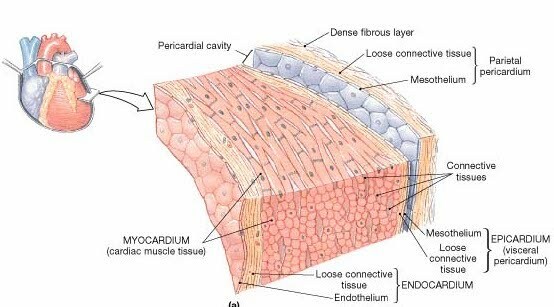 The cardiac tissue is multi-layered. Three layers constitute the proper heart tissue. An additional layer, the pericardium creates the pericardial sac. Endocardium. The innermost layer of tissue that lines the chambers of the heart. Its cells are similar to the endothelial cells that line blood vessels. The endocardium also provides protection to the valves and heart chambers. Myocardium. The myocardium is the muscular layer of the heart, between the epicardium and the endocardium. The myocardium is responsible for the heart's pumping action and contracts to pump blood out of the heart and then relaxes as the heart refills with returning blood. The myocardium is composed of cardiomyocytes, which are striated muscle cells featuring myofibrils. Other cells (i.e. cardiac fibroblasts) and connective tissue (i.e. extracellular matrix) contribute to myocardial structure. The myofibrils, built of numerous myofilaments, are visible threads that run parallel to the long axis of the cells and provide contractive capacities to these cells. Epicardium. When the visceral layer comes into contact with heart it is known as the epicardium. The epicardium is the layer immediately outside of the myocardium. The epicardium is largely made of connective tissue and functions as a protective layer. Pericardium. The pericardium is a double-walled sac containing the heart and the roots of the great vessels. The pericardial sac has two layers, a serous layer and a fibrous layer. The serous pericardium is divided into two layers, the parietal pericardium, which is fused to and inseparable from the fibrous pericardium, and the visceral pericardium, which is part of the epicardium. The pericardium encloses the pericardial cavity which contains pericardial fluid. The pericardium fixes the heart to the mediastinum, gives protection against infection, and provides the lubrication for the heart. Two sets of veins and two arteries are the major inlet and outlet vessels serving the heart. In addition, the coronary circulation ensures the heart itself is irrigated. Aorta. The aorta is the main artery in the human body, originating from the left ventricle of the heart and extending down to the abdomen, where it splits into the common iliac arteries. The aorta distributes oxygenated blood to all parts of the body through the systemic circulation. Pulmonary artery. The pulmonary artery transports blood from the heart to the lungs. While most major arteries branch off from the aorta, the main pulmonary artery extends from the right ventricle of the heart and branches into left and right pulmonary arteries. The left and right pulmonary arteries extend to the left and right lungs, respectively. The pulmonary arteries are unique in that unlike most arteries which carry oxygenated blood to other parts of the body, the pulmonary arteries carry de-oxygenated blood to the lungs. Pulmonary veins. Pulmonary veins are responsible for carrying oxygenated blood from the lungs back to the left atrium of the heart. This differentiates the pulmonary veins from other veins in the body, which are used to carry deoxygenated blood from the rest of the body back to the heart. Humans have four pulmonary veins in total. The two right pulmonary veins (superior and inferior) carry blood from the right lung, and the two left pulmonary veins (superior and inferior) carry blood from the left lung. Venae cavae. The venae cavae return deoxygenated blood from the body into the right atrium of the heart. The inferior vena cava travels up alongside the abdominal aorta with blood from the lower part of the body. It is the largest vein in the human body. The superior vena cava is above the heart, and forms from a convergence of the left and right brachiocephalic veins, which contain blood from the head and the arms. Coronary circulation. Coronary circulation is the circulation of blood in the blood vessels of the heart muscle myocardium. Coronary arteries supply blood to the heart muscle. They include the left main coronary artery, that divides into the left anterior descending artery and the circumflex artery; the right coronary artery, that branches into the right posterior descending artery and the acute marginal artery; and smaller branches of the coronary arteries that include the obtuse marginal, septal perforator, and diagonals. The vessels that remove the deoxygenated blood from the heart muscle are known as cardiac veins. These include the great cardiac vein, the middle cardiac vein, the small cardiac vein and the anterior cardiac veins. The contraction of cardiac muscle is initiated by electrical impulses known as action potentials. The rate at which these impulses fire controls the rate of cardiac contraction (i.e. the heart rate). The cells that create these rhythmic impulses, setting the pace for blood pumping, are called pacemaker cells, and they directly control the heart rate. They make up the natural pacemaker of the heart. Sino-atrial node (SA node). Also known as the sinus node, it consists of a cluster of cells that are situated in the upper part of the wall of the right atrium. The electrical impulses are generated there, and move from cell to cell down through the heart until they reach the atrioventricular node. Atrio-ventricular node (AV node). The AV node serves as a gate that slows the electrical current before the signal is permitted to pass down through to the ventricles. This delay ensures that the atria have a chance to fully contract before the ventricles are stimulated. Bundle of His. The conducts the electrical impulses that regulate the heartbeat, from the atrioventricular node in the right atrium to the septum between the ventricles and then to the left and right ventricles. Also called atrioventricular bundle. The bundle begins at the AV node located at the inferior interatrial septum, and passes into the subendocardium through the right fibrous trigone to the interventricular septum, after which it divides into right and left limbs that pass along either side of the septum, branching to the walls of the ventricles. The left bundle branch further divides into the left anterior and the left posterior fascicles. These bundles and fascicles give rise to thin filaments known as Purkinje fibers. Bachmann’s bundle. The Bachmann’s bundle (BB), also known as the interatrial bundle, is well recognized as a muscular bundle comprising of parallel aligned myocardial strands connecting the right and left atrial walls and is considered to be the main pathway of interatrial conduction. Bachmann’s bundle is, during normal sinus rhythm, the preferential path for electrical activation of the left atrium. It is therefore considered to be part of the “atrial conduction system” of the heart. Purkinje fibres. Also known as subendocardial branches and rami subendocardiales, Purkinje fibres are located beneath the endocardium. They are formed of modified cardiac fibres composed of Purkinje cells, occurring as an interlaced network in the subendocardial tissue and constituting the terminal ramifications of the conducting system of the heart. The term is sometimes used loosely to denote the entire system of conducting fibres.